Recently I wanted to add plants to my living room. Some greenery would be nice on the eyes and let’s not forget that plants are also good for improving air quality. It didn’t take long for me to realize that I don’t really have anywhere to put the plants. In other words I needed a shelving unit. After visiting local hardware stores I was taken aback by the prices. Truth be told, their shelves were massive, very heavy. I’m guessing they are for tools. Ikea it is then, I thought to myself. Not sure why I didn’t look there right away. Soon after opening up the Ikea website I found the Hyllis shelving unit. 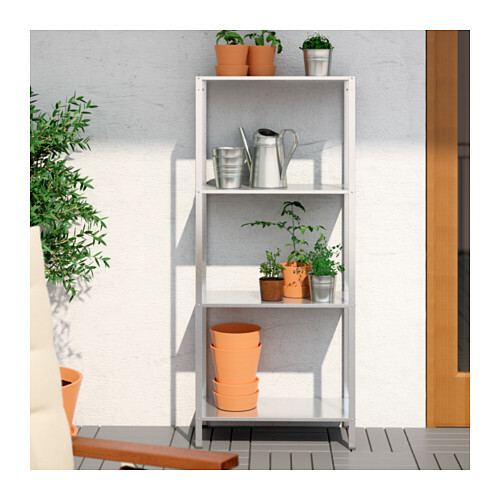 It’s a shelf unit made from galvanized steel. Perfect for plant shelves where it’s possible to get the shelves wet when watering them. They are just 15$ and assembly was a piece of cake. I wholeheartedly recommend this shelving unit if you’re looking for a place where to put your plants. This entry was posted in Home Decor and tagged home decor, home decor ideas, ikea hacks, shelving ideas. Bookmark the permalink.